Over the last couple of weeks we've been discussing the "Exposure Triangle". To date we've covered aperture and shutter speed and today we round out the discussion with the third element - ISO. Referring to the graphic at right, you will see ISO is responsible for determining how sensitive your camera sensor is to the amount of available light. The higher you set the ISO, the faster shutter speeds you can realize at higher f-stops. Sounds great! Why not crank it up all of the way all of the time? Well, as with most things in life, it comes with a cost. ISO is not selective in which parts of the image are amplified. As a result, higher ISO images introduce more "noise" or "grain" into the image. So why manipulate ISO if it will result in noisy images? Because it can help us achieve things we couldn't do without it. Consider a scenario where you're trying to freeze the motion of a moving subject. The available light isn't the greatest and you zoom in and open the aperture wide open (smallest f-stop) - as much light as you're going to get without introducing flash. Your camera reports at 200mm you're shutter speed is going to be 1/60th of a second. WAY TOO SLOW! Remember, we want at least 1/200th and depending on the speed of the object we're trying to capture we probably need to be faster yet. Now what? Well, the only thing left in the bag of tricks is to up the ISO. Each time you increase the ISO, you effectively double the amount of light. For the above scenario, moving from ISO 100 to ISO 200 would up the shutter speed to 1/120th of a second. Moving to ISO 400 moves to 1/240th of a second, etc. This doubling (or halving) of light is consistent with all three elements of the exposure triangle. Need more light? Drop to a lower f-stop, increase your ISO or slow your shutter speed. Less light? Try a higher f-stop, faster shutter speed and/or lower ISO. It's understanding how each of these three elements impact your pictures and how they can be used together to achieve the desired effect that will allow you go get what you desire from your camera. The moral of the story is don't be afraid to raise your ISO when you need it. Today's technology allows for high ISO images with minimal noise. If you do find yourself with a noisy image, many post processing software applications also have ways to effectively deal with noise after the fact. If you have to decide between dealing with noise or completely missing the shot because you're set too slow.... I'll take the noisy image every time. 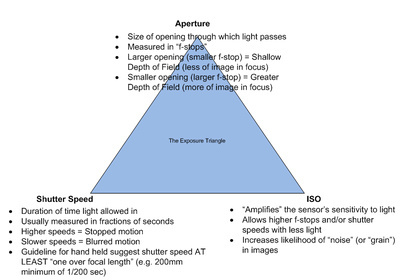 If you're interested in reading more on the exposure triangle, Digital Photography School has some excellent materials from some very amazing photographers. Next week we'll begin to look at some tools on your camera that will help you determine how well you're exposing your photographs.